1. 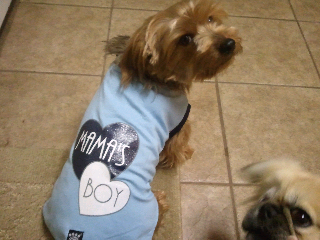 I won't complain about the doggie clothes mama puts on me. I doesn't mind some of the shirts I wears cos I does gets cold. But those jammies are just strange and I is still not wearing them boots! Well mebbe I might complain just a little tiny bit. 2. I will lose some of this extra poundage I has but then mama can't call me her chunky monkey which she seems to like to say. I does gots a chubby belly but its only cos she feeds me some really good food and she make some yummy treats. Heck, iffen I don't likes them then she throws them away and makes more so how am I supposed to lose a few pounds iffen she keeps tryin until I loves them. I mean the point is for her to make treats that is Kirby approved and iffen they is Kirby approved that means I ate them. It's a vicious cycle! 3. I will share my toys and treats with my foster furiends but I already does that. What's mine is theirs cos really I likes to play with doggers anyways except I did has one foster who chewed up most all of my toys. Mama had to hide my favorites cos she could tell I was really gettin upset with that dogger even iffen I did loves her cos she was gettin all the squeakers outta my toys and what fun is a toy that don't squeak! 4. I will pick up my toys from all over the house iffen mama will teach me how to do it. So I guess I will learn more tricks which is really lots of fun and I gets lots of treats which kinda ruins my number 2 resolution. I will be so very happy to see you come home every time no matter iffen you been gone 20 minutes or all day. I will cuddle close to you when I can tell you is sad and lonely. I will NEVER chew any of your pretty shoes. I will sleep in your bed with you so you don't get scared. I will let you sleep until almost 8:30 on the weekends. I will welcome each new foster with a toy and a game. and yes, I will pose for these pictures you likes to take ALL THE TIME. After all I really is mama's boy! I can tells 2012 is gonna be another great year!